To identify the VLAN a packet is belonging to, switches use tagging to assign a numerical value to each frame in a network with multiple VLANs. This is done to ensure that switches know out which ports to forward frames. For example, consider the following network topology. There are two VLANs in the toplogy pictured above, namely VLAN 3 and VLAN 4. Host A sends a broadcast packet to switch SW1. Switch SW1 receives the packet, tags the packet with the VLAN ID of 3 and sends it to SW2. SW2 receives the packet, looks up at the VLAN ID, and forwards the packet only out the port Fa0/1, since only that port is in VLAN 3. 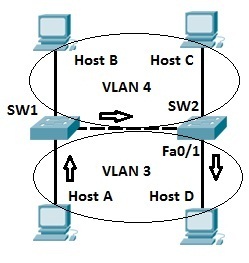 Host B and host C will not receive the packet because they are in different VLAN than host A. When forwarding a tagged frame to a host device a switch will remove the VLAN tag, since host devices don’t understand tagging and would drop the packet.